Meywalk® 2000 is a gait trainer for people with various types of disabilities. Meywalk® 2000 is spring suspended, meaning that seat and trunk support follow the movements of the user and provides optimal support through all the phases of gait. The spring suspension promotes a natural gait pattern. Meywalk® 2000 is available in two sizes, medium for children from the age of 6 – 14 years and large for young people from around 14 years of age up to to adults. Meywalk® 2000 has a trunk support and seat, which are both continuously variable with regards to height. This means that Meywalk® 2000 can be resized to fit the user and provide optimal support at all sizes. The trunk support is chosen on the basis of the circumference of the user’s chest and is available in 5 sizes: 70, 90, 105, 120 and 130 cm respectively. Furthermore Meywalk® 2000 has a handle bar that can be angled continuously with respect to the user. Getting in to Meywalk® 2000 is easy by means of the unique lifting and lowering system. As shown in the photos to the left the tilt bar of the gait trainer is unlocked at the front of the frame thereby lowering the seat. The user places her or his wheelchair between the rear wheels of Meywalk® 2000 so the distance to the seat of Meywalk® 2000 is minimized. 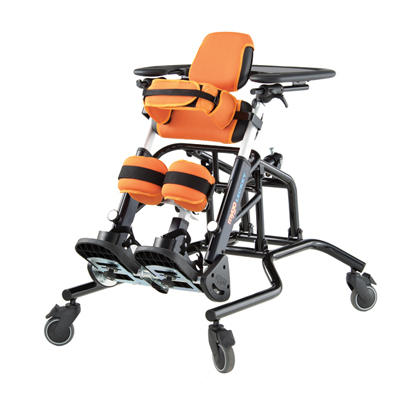 The user can now get into the gait trainer with minimal support and the seat is relifted. Using a wide range of accessories Meywalk® 2000 can be fitted accurately to each user. Below Meywalk® 2000 is shown with hip supports and to the left is shown a leg separation board that keeps the legs of the user separated, a pair of leg guides that prevent the user from having a foot caught under the wheels and an antitip support for users with intense spasms; this will prevent the gait trainer from tilting backwards. Call 604-821-0075 or request details about the Meywalk 2000 using the form below. Question about the Meywalk 2000 ?